Bauxite is the main ore of aluminium. It is mostly aluminium oxide. 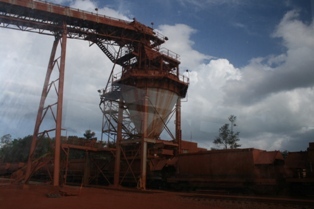 Bauxite is the most important aluminium ore. It is largely made up of the minerals Gibbsite Al(OH)3, Boehmite γ-AlO(OH), and Diaspore α-AlO(OH), together with the iron oxides Goethite and Hematite, the clay mineral Kaolinite and small amounts of Anatase TiO2. 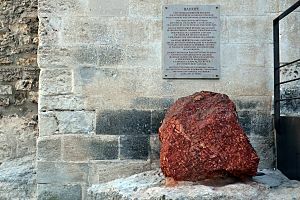 It was named after the village Les Baux-de-Provence in southern France, where it was first discovered in 1821 by geologist Pierre Berthier. There are two main kinds of bauxite ores: carbonate bauxites (karst bauxites), and silicate bauxites (lateritic bauxites). 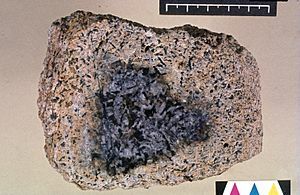 Carbonate bauxites were discovered earlier, and occur mainly in Europe and Jamaica above carbonate rocks such as limestone and dolomite. Lateritic bauxites occur in many countries of the tropical belt. They were formed from various silicate rocks such as granite, gneiss, basalt, syenite, and shale. For bauxite to be created there must be intense weathering conditions and very good drainage. Bauxite deposits with highest aluminium content are frequently located below an iron-bearing surface layer. In lateritic bauxite, the aluminum hydroxide contained in laterite deposits is almost entirely a form called gibbsite. Bauxite Facts for Kids. Kiddle Encyclopedia.